These ice bags made from strong durable plastic offer the perfect solution for wine cooling outdoors or on the go. 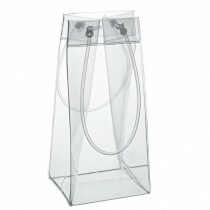 Idealfor a day at the races, or for use in a pub beer garden - simply fill with ice and water and add a bottle. Easy carry handles make this a quirky and practical accessory. Ice Wine Champagne Bags from MBS Wholesale, supplier of quality great value Bar and Glassware.